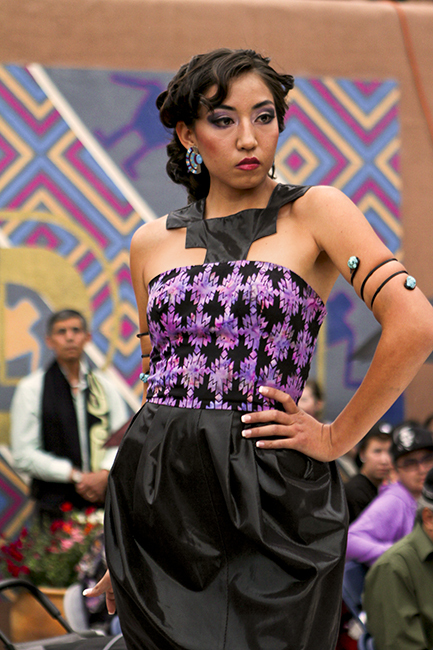 I got the great opportunity to interview Navajo/Mayan fashion designer Consuelo Pascual about her newest designs that debuted at the Fashion HEAT show held in Santa Fe during Indian Market. 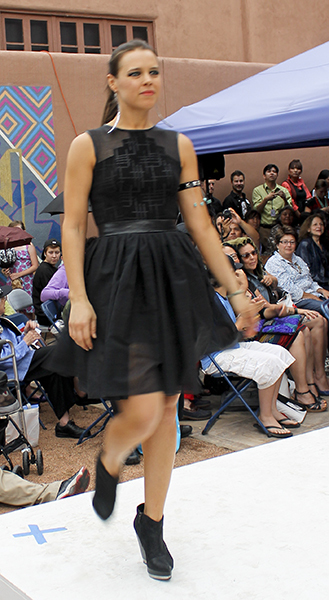 Organized by Native American and First Nations art scholar and curator Amber-Dawn Bear Robe, this free event was one of the most-talked about Native-focused fashion shows of the past year and featured some of the most prominent Native American fashion designers producing today. In the interview below, Pascual talks to BB about the ins and outs of fashion design: from the structural to the ephemeral, fashion is an exciting art form, and is one that is gaining a better footing in the American Indian art world. BB: Consuelo! Thank you for participating in this interview series. 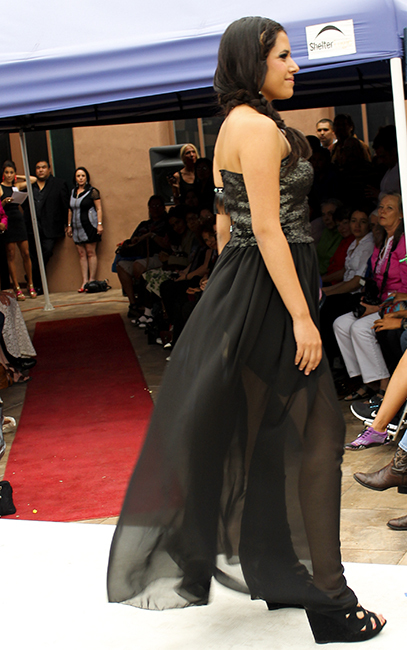 Several designers launched new collections at the Fashion HEAT show held a couple weeks ago in Santa Fe. When did you start planning and making this collection? CP: For this show I created three new looks and I had a couple of dresses that were from a year ago. I worked on the patternmaking and sewing during the summer leading up to the show, and did the fit alterations the week of the show. The design process is a balance of sketching and draping to see how the concepts could be realized. Sometimes I come up with crazy ideas and then it's like "Okay, now how do I make that and put it together?" haha! BB: Haha!, yes, I think many designers are in the same boat when it comes to putting crazy ideas into something you can wear. I'm always interested in the creative process - What inspired this collection? CP: I usually find inspiration from random external sources but the fabrics inspired and spoke to me! I would definitely say it was about the concept of light. For example, fabric transparency and light showing through the fibers and also how light reflects off the fabric and creates dimension. 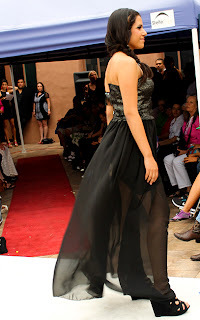 In the past I designed mostly in metallic/silvery fabrics and this time I worked with some iridescent fabrics, glittery cotton, sheer cotton, shiny black suedecloth, metallic fur, black-on black design, and flowy chiffon. 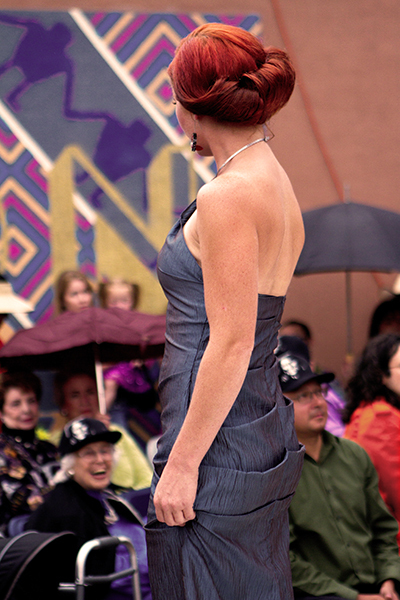 I loved the iridescent blue taffeta so much that I even went outside to time the daylight so I could see what it would look like on the day of the fashion show but it ended up being cloudy and rainy on the actual day of the fashion show! BB: Wow! I love that you think about how the fabric and materials will interact with our environment and weather - very cool concept! Can you talk a bit more about the materials you used for this collection? CP: For the newest looks I challenged myself and worked with flowy chiffon. I'm used to working with mid-weight fabrics and sculpting them in such a way, it was a very different experience to let go of some of that control and just let the fabric move freely. Of course I ended up pairing a chiffon skirt with the metallic fur top to give it a little bit of edge. I really enjoy mixing different fabrics together like the cotton batik prints with iridescent and shiny materials and putting faux leather bias on a sheer cotton fabric. BB: I always like to see how a designer's style evolves through time, yet still maintains a distinctive aesthetic. Can you describe how this collection relates to and/or departs from your other collections? 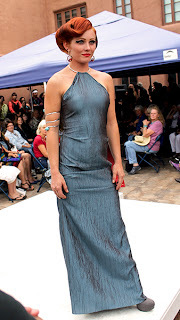 CP: The blue iridescent dress with black pleated detail was a nod to my past pleated designs. I love pleating and manipulating fabric but I'm also learning about style line details and combining prints and textiles. I also really wanted to show a range of looks and combination of fabrics compared to what I've done in the past. I played with different silhouettes such as fuller and flowy skirts and combining fabric textures instead of just using one fabric and creating texture through fabric manipulation. BB: Wow! Yes, a lot of people don't realize how much work goes into fashion design, can you tell us what you think is the easiest and hardest aspects of being a designer? CP: I would be very cautious to say that being a designer is easy because it is work to make a pattern and then sew it. Design takes dedication and passion and this makes the creative process so much fun. But what I love about design is the challenge of innovation and evolution. I am open to learning more and doing more, that's what drives me. I want to create outerwear and daywear and accessories. I want to experiment with silk and fine fabrics. I want to strengthen my skills and I feel that I have so much more to learn and say and it's just so exciting to see how fashion design evolves. I have taken beginning level pattern classes, so I feel like I have to push through construction concepts at times, but it is very much a labor of love. BB: And you get to see your designs on the runway! The Fashion HEAT show is getting lots of press and positive reviews from folks in the audience. What was it like being a part of Fashion HEAT? CP: It was such a great experience for me. I feel so grateful to Amber-Dawn Bear Robe and the Gaussoin family for inviting me to be part of such an amazing event. I have been a huge fan of these artists for years, I love their work! The amount of talent from the other designers is so fierce that I was very nervous about being a part of this show! A few years ago I never would've imagined having this kind of opportunity and experience. It was so much fun and seeing all of the innovative artists work together in one show was awesome. 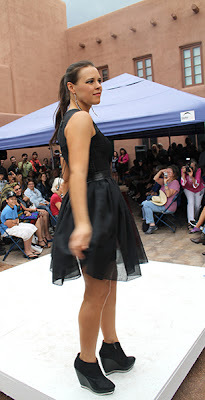 The models did such a great job and it was so fun working with them. 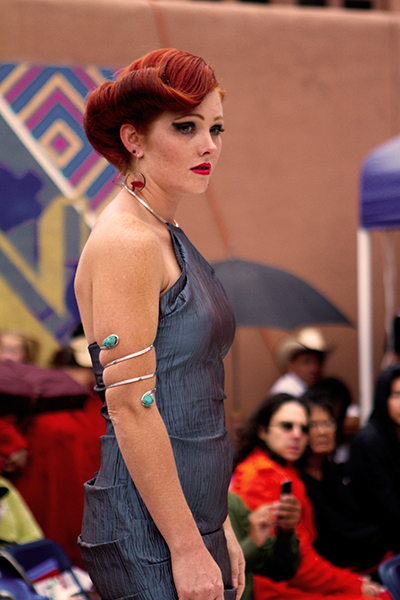 Fashion HEAT showed that we can balance traditional and contemporary jewelry and fashion and that as artists we shouldn't have to compromise our work to meet certain standards and expectations, in the end it is still Native Design. 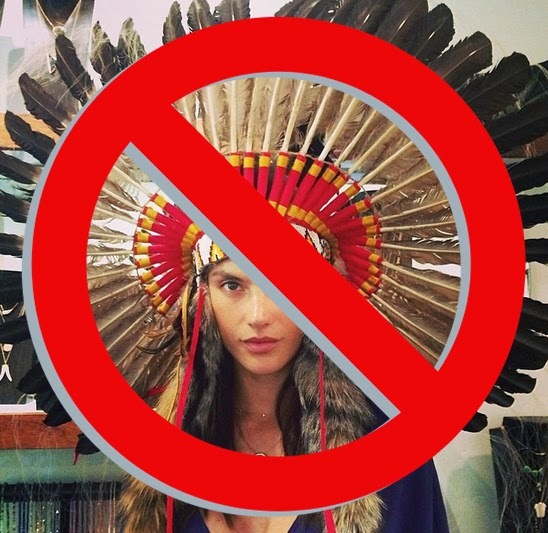 BB: Sounds like you've come up with a good way of looking at Native Design. Do you have any advice for aspiring designers? CP: Yes! Sketch! Do research! Go fabric shopping! Go shopping and look at garment details and fabrications. Work hard and don't give up when it gets tough. Don't get caught up in what's trendy and don't be afraid to play and have fun and have your own point of view. The best thing about design is diversity, if everyone did the same thing then it would be pretty boring. BB: Consuelo, you've been an awesome designer to watch grow and define a space in the fashion world, so I'm wondering, what's next for you?! CP: Hey, that's also what I want to know! Well, right now I feel very fortunate to help out with a few things for an upcoming 'Dancing Earth' production. 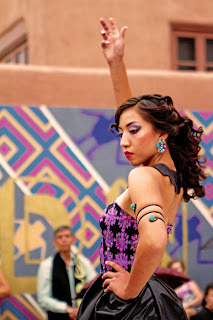 Rulan Tangen has brought together an amazing group of dancers and designers including a former instructor, Cheryl Odom, who is the lead costume designer for the 'Walking The Edge of Water' show. This is my first experience with costume so I am developing a sense of the costume design world. 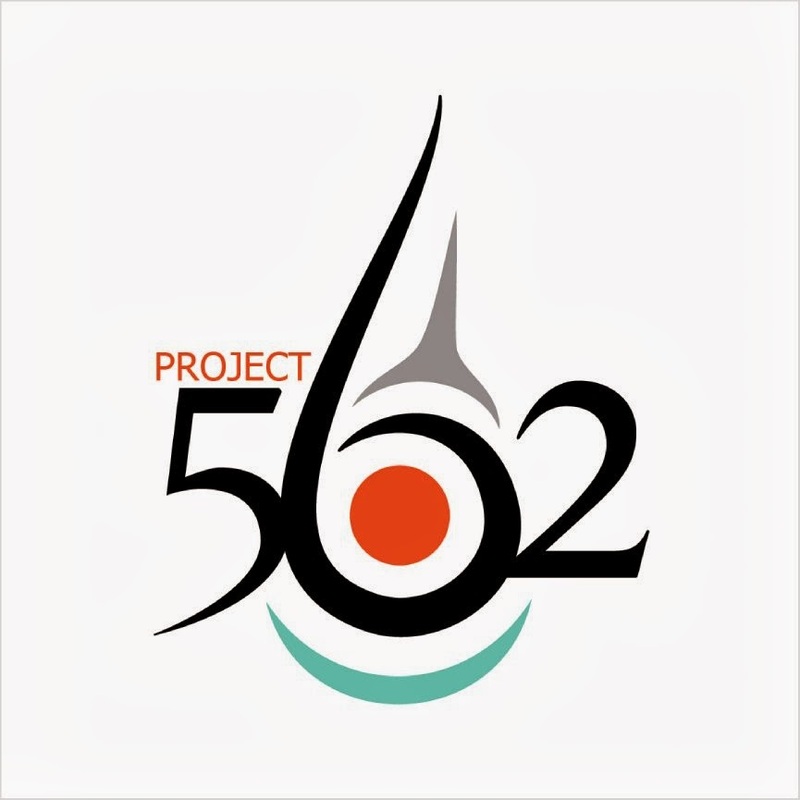 The dance performance piece is very relevant to all the water issues that many indigenous communities around the world are struggling with. I encourage everyone to look into 'Dancing Earth' and support or attend this performance if they can. 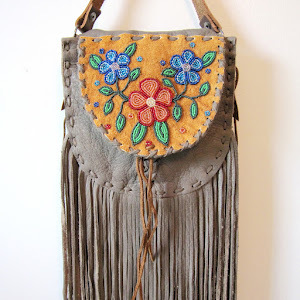 Check out Consuelo on Beyond Buckskin by clicking here, or check her out on the Boutique site by clicking here. All images are courtesy of Ralph Contreras and DGTL/NVJO Victor Pascual. Love your designs. Thanks for sharing it. Saivana Exports Private Limited, dealing with some of the top designers and fashion houses across the globe- especially from France, Italy, and the United States of America. Looking for Garment Exporter from India . Feel free to contact us.